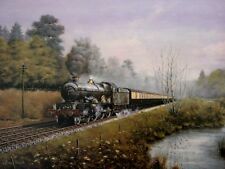 Locomotive, steam locomotive, steam train, steam engine, oil painting. overseas and will be send rolled up in a strong art tube. Very rare to hit the open market. High quality print off a superb original oil paintings will stand out in any room. SIZE APPROX 17.5" x 13.5". 37cms x 45cms. The painting is in good condition. High quality print off a superb original oil paintings will stand out in any room. Original Watercolour Steam Train by Roger Simpson. Dispatched with Royal Mail 2nd Class. A FABULOUS ORIGINAL WATERCOLOUR / ACRYLIC PAINTING BY TONY FORREST AND SIGNED OF 7025 SUDELEY CASTLE, CASTLE CLASS ON DIDCOT SHED. Tony Forrest has long been regarded as one of the UK’s finest living wildlife artists. A steam train leaving a station - probably London. Height 25 cm. dates 1994 ?. and signed Martin Parker. A delightful original Mid Century watercolour showing a steam train passing through Bridgnorth Station. It perfectly captures the ending of the romantic era of the steam train - even the adverts on the noticeboards create nostalgia. Tony Forrest has long been regarded as one of the UK’s finest living wildlife artists. 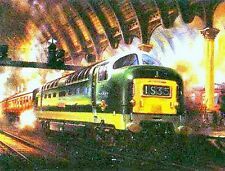 This is one of four original and rare train paintings that were commissioned and painted in the early 1990’s. (Opposite the Mowlem Theatre). Artist: W. Jervis. Details: Oil and acrylic painting on board featuring Stephenson's Rocket. Signed and dated 1980 in one lower corner. Condition: Overall in fair-good condition. Of a Steam Train. 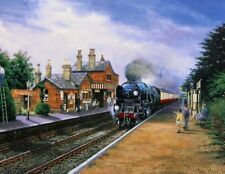 Superbly painted in fine detail and showing a Stream Locomotive travelling at Full Steam pulling Carriages. Not signed but quite obviously by an accomplished artist, in this miniature size. This is an original Watercolour Painting of a steam train at Bloomfield Railway station, in East Belfast in circa 1949, by the artist J Wilkinson, who has signed it to the bottom right, please see photos. On the bottom left in pencil has been added the location, Bloomfield 1949. Bloomfield was a railways station in the Bloomfield area of East Belfast, long since closed. The painting is mounted and framed in a wooden frame and is behind glass ready to hang and enjoy. It measures 61 cm x 46.5 cm including the frame. As with all my art if you are not 100% delighted with it please return it for a full no quibble refund. Artist and signature: Signed Don Micklethwaite lower LH corner. 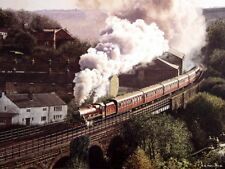 Depiction or Location: North Yorkshire Railway Steam Train; A4 Leaving Grosmont from Pickering. Type of artwork: Original Oil on Box Canvas Painting. A stunning original contemporary watercolour painting depicting 'The Globe 1830' Steam Train Railway (S&DR). It is presented in a simple mount. The size of this painting including mount is approx. 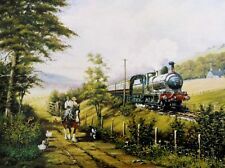 Original Oil Painting 4.4.0 Glen Douglas Train Steam Engine Naive On Board.